This voltmeter design gives you the opportunity to add a useful too to your workbench. The True RMS Audio AC Volt meter is a portable unit based on the Analog Devices AD636JH true RMS to DC converter and on the ICL7106 A/D converter and LCD driver. It measures the true RMS value of an audio signal up to a level of 100V RMS in four scales: x1mV RMS, x10mV RMS, x100mV RMS, and x1000mV RMS. A rotary switch in the front of the meter lets you display either volts or dBs. For the dB measurement, the 0dB level is set at 774.6mV RMS (0dBm = 1mW at 600 ohm). The voltmeter is powered by a 9V battery. Photo 1 shows the complete meter. The Analog Devices AD636JH, on which the voltmeter is based, is a low- power monolithic IC that performs true RMS to DC conversion on low-level signals from 0mV to 200mV RMS. The AD636 includes an auxiliary dB output derived from an internal circuit point that represents the logarithm of the R1's output. An externally supplied cur rent sets the 0dB reference level and corresponds to an input level of 774.6mV RMS. According to the manufacturer, the frequency response ranges from 1.2MHz at 0dBm to greater than 10kHz at -50dBm. The AD636 computes the true root- mean-square of a complex AC (or AC plus DC) input signal and gives an equivalent DC output level. The true RMS value of a waveform is a more useful quantity than the average rectified value because it measures the power in the signal. An averaging capacitor is the only external component required to perform measurements to the filly specified accuracy. Its value optimizes the trade-off between low-frequency accuracy, ripple, and settling time. The 200mV full-scale range of the AD636 is compatible with many popular display-oriented ADCs. Also, the low-power supply current requirement — typically 800uA — permits use in battery-powered hand-held instruments. FIGURE 1: The electronic diagram of the voltmeter. The Intersil ICL7106 is a low-power, 3½ digit A/D converter with seven segment decoders, display drivers, a reference voltage, and a clock. The ICL7106 is de signed to interface with a liquid crystal display (LCD), and for this reason includes a multiplexed back-plane drive. It also features auto zero to less than 10uV, zero drift of less than 1uV/C, input bias current of 10pA (maximum), and rollover error of less than one count. The display that I used for the meter is a typical 3½ digit LCD with ½” character height. I don’t have the exact part number of the LCD that I used because I had it in my stock for a long time, but I believe that the LCD available from Digi-Key with the part number 67-1789-ND is suitable. 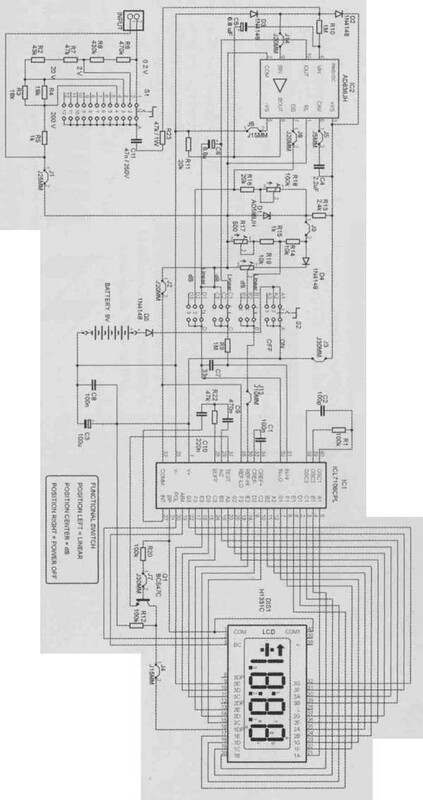 The voltmeter is based on the block diagram of Figure 17 (Portable, High-Z Input, RMS DPM and dB Meter Circuit) of the Analog Devices AD636 d2tasheet. The complete electronic diagram of the voltmeter is shown in Fig. 1. The 1M-ohm input attenuator allows full-scale range for signals up to a maximum of 100V RMS in four positions: x1mV RMS, x10mV RMS, x100mV RMS, and x1000mV RMS. After the attenuator, the signal is coupled through a 47nF capacitor and a 47 k-Ohm protection resistor to the AD636 buffer amplifier, which is connected in an AC bootstrapped configuration to minimize the loading of the input attenuator by increasing the input impedance of the buffer. Then the buffer amplifier drives the 6.7k-Ohm input impedance of the AD636. The LINEAR or the dB outputs of the AD636 are driven through the S2 switch to the input of the ICL7106. The COM terminal of the ICL7106 provides the false ground required by the AD636 for single-supply operation. An AD589 1.2V reference diode is used to provide a stable 100mV reference for the ADC in the linear RMS mode by using the trimmer R17 (500 ohm); in the dB mode, the trimmer R18 (100k) is used to set the 0dB indication. A diode 1N4148 is inserted in series to provide correction for the temperature coefficient of the dB scale factor. The trimmer R19 (10k) is used to adjust the scale factor of the dB scale. The construction of the voltmeter is complicated, so I designed a PCB using the demo version of the Eagle Layout editor. You can download this demo version of the program free of charge from the Cadsoft website (cadsoftusa.com). The demo version is fully operational, except for a limitation on the maximum dimensions of the PCB, which was not a problem for this project. 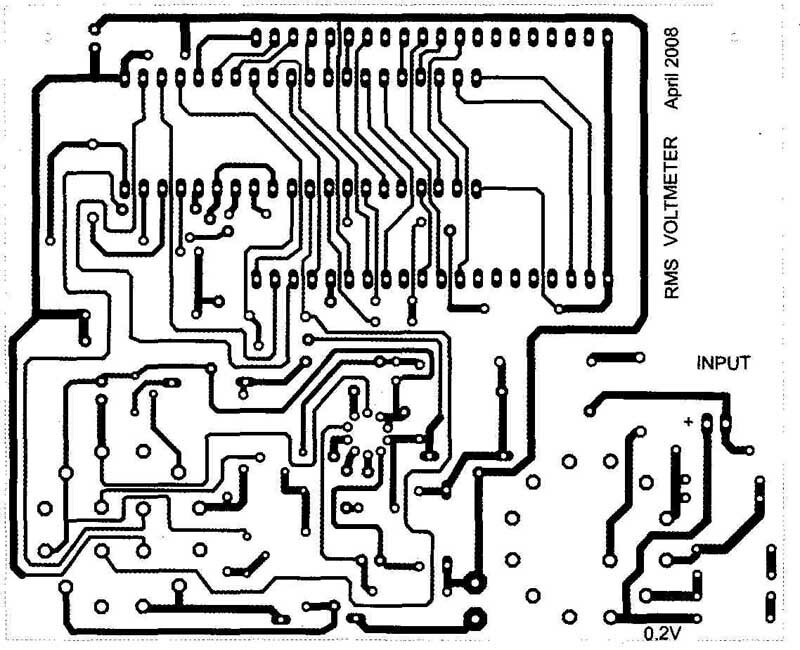 The PCB is shown in Fig. 2, while the placement of the components on the PCB is shown in Fig. 3 and Photo 2. The two rotary switches (S1 and S2) are placed directly on the PCB to facilitate the construction of the meter. The ICL7106, the resistor R22, the capacitor C1, and the jumper J7 are placed below the LCD. The LCD is not soldered directly to the PCB; two 20-pin sockets are used. This also permits some extra space between the ICL7106 and the LCD. For the correct operation of the LCD, use two cables to connect pin 2 of the LCD with pin 20 of the ICL7106 and pin 3 of the LCD with pin 19 of the ICL7106 as shown in Photo 3. Figure 4 shows the front plate that I used for the meter. I printed this diagram to a self-adhesive transparent paper, which I then put on the front face of the metallic box of the meter. This gave a very nice look for the meter as shown in Photo 1. I used the same diagram as a guide for the opening of the two holes for the rotary switches and the hole for the LCD. For the calibration of the voltmeter, I used a Hewlett-Packard HP 3478A multimeter. This digital multimeter offers 3½ to 5½ digit resolution for measuring DC volts, true RMS AC volts up to 300kHz, two-wire and four-wire ohms, and DC and true RMS AC current. The input impedance of the HP3478A is 1M-ohm shunted by a capacitance less than 60pF. The accuracy of the HP3478A multimeter for the measurement of the AC voltage as given by the manufacturer is shown in Table 1. I performed the calibration of the voltmeter as follows: I connected a sine-wave generator at the input of the RMS voltmeter with the frequency set at 1kHz and the level at 180mV RMS. Then I adjusted the trimmer R17 (500 ohm) until the voltmeter display was exactly the same as the HP3478A multimeter display. For the calibration in the dB range, I set the level of the generator at 774.6mV RMS and adjusted the trimmer R18 (look) until the meter indicated exactly 0.0dB. Then I reduced the level of the generator to 7.74mV RMS and adjusted the trimmer R19 (10k) until the display indicated -40.0dB. The total battery current required for the operation of the voltmeter is about 2.8mA. After the calibration of the meter, I per-formed some measurements in order to compare the indications of the meter against the HP 3478 multimeter. 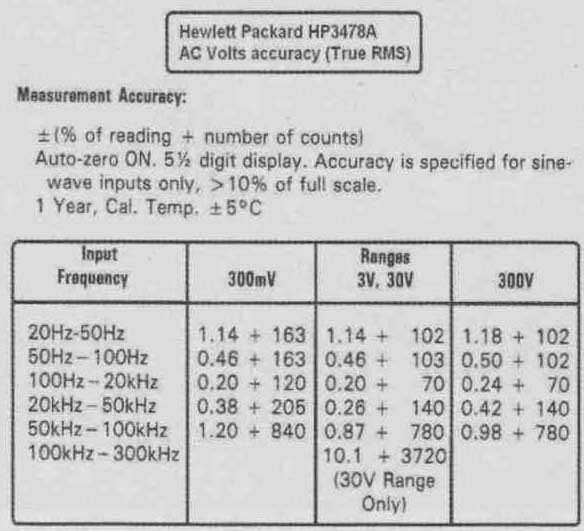 The accuracy of the HP multimeter as given in its operating manual is shown in Table 1. The accuracy is specified only for a sine-wave input with a level greater than 10% of the frill scale. For the accuracy measurements, I used sine-wave and square-wave inputs in the range from 5mV RMS up to about 25V RMS. This was the maximum level that I could have from the power amplifier I used for the tests. 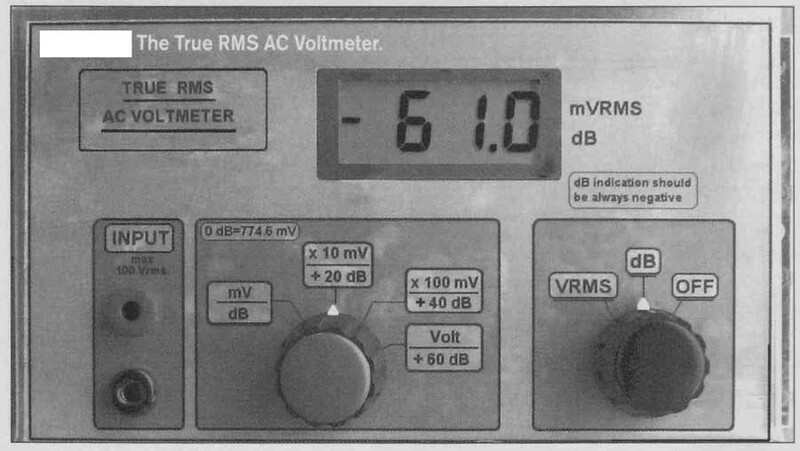 Note that when the meter is set in the dB range, the LCD display should always be kept less than 0dB; otherwise, the accuracy of the meter is not good. When the indication goes above 0dB, the higher voltage range should be used. I connected both voltmeters to the same signal and checked the voltmeter displays. The results are shown in Table 2 for the sine-wave and in Table 3 for the square-wave. 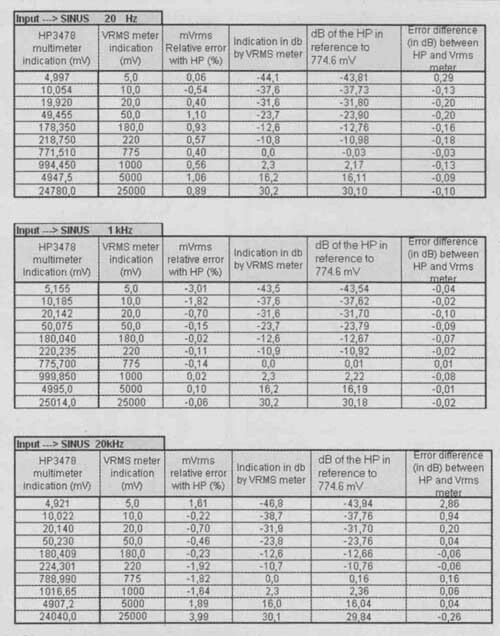 The first column gives the results of the HP multimeter, and the second column shows the AC voltmeter results. 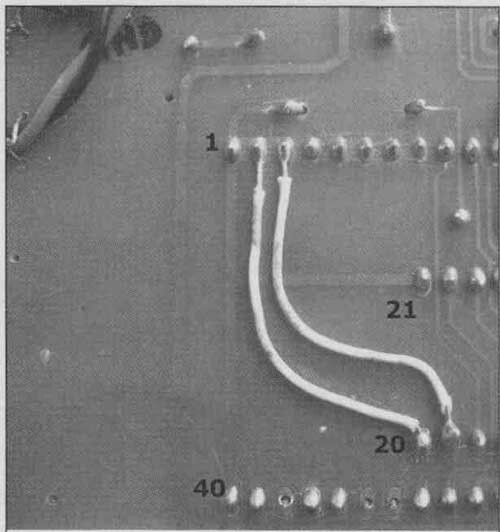 PHOTO 3: The additional connections on the PCB of the voltmeter (see text). FIGURE 4: The front face of the voltmeter. TABLE 1: Accuracy of HP multimeter. TABLE 2: Sine-wave accuracy measurements. TABLE 3: Square-wave accuracy measurements. In the third column, the relative error between the two displays is computed. The fourth column shows the results of the voltmeter when it is set in the dB scale with the same signal as before. In the fifth column I computed in dB the indication of the HP3478 in reference to 774.6mV RMS. The sixth column shows the difference between the fifth and the fourth column. By examining the results for the volt age range of the meter, you can see that for signals in the frequency range from 20Hz to 10kHz the differences are less than 2%, except in the measurement at a level of 5mV RMS at 1kHz, which is 3%. With the voltmeter set in the dB scale, the differences are very small and below ±0.3dB. When the frequency is set to 20kHz, the differences are also below 2%, except at the level of 25V, where the difference is about 4%. 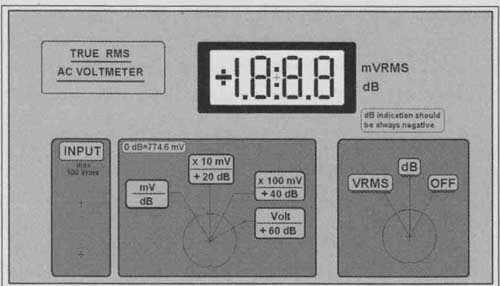 When the measurements are performed in the dB scale, the results are good except at the 5mV RMS range. This is a very useful piece of test equipment. It measures the true RMS value of an audio signal both in volts and dBs with very good ac curacy. It is also portable and very re liable. If you don’t have such equipment in your lab, this is a good opportunity to build one.